Liberty Financial Markets also does business as Express Futures Inc, a guaranteed Phillip Capital and provides a comprehensive array of services for Futures & Options traders and investors. Trading Platforms include: Trade Fire, CQG Trader, eSignal, MultiCharts, QST, RealTick, R Trader, T4,Trade Navigator and TT/X Trader. 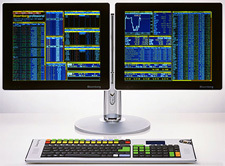 Electronic trading is at the cutting edge of a new generation of brokerage services. To remain flexible and responsive to our clients' needs, Phillips Capital LLC has made significant strategic alliances with the industry's preferred trading platforms to provide clients direct access to trade on global live prices, market information, portfolio risk management, account statements and so much more. With technology and speed being at the forefront of the futures industry, it is important to choose the platform that best suits both you and your trading needs and strategy. Phillips Capital offers a variety of execution platforms with each presenting their own unique features. TradeFire—TradeFire is a cutting edge platform that combines powerful trading tools for real-time execution and analysis of the futures markets. TradeFire has no additional per contract software transaction charge and it supports built-in and advanced order strategies with a customized account manager to track historical order information. RITHMIC—We offer both R-Trader and R-Trader Pro through RITHMIC. These trading platforms are offer quotes, depth of market pricing and option strikes with real time updates. RITHMIC provides real-time Risk Management screens and the ability to modify and place orders through one trading screen. R-Trader Pro offers charting capabilities with approximately 100 studies which can stream real-time into Microsoft Excel spreadsheets as well.